Guest appearances and crossovers are par for the course in the superhero comics of today, but it wasn’t always that way, at least not at DC Comics. In 1966 you had DC’s big guns teaming up every month (more or less) in Justice League of America, and Superman and Batman appearing together regularly in World’s Finest. And The Brave and the Bold had by now evolved into a book featuring a constantly revolving lineup of (usually) two headliners (although Batman would soon lock down one of the co-starring slots as an ongoing gig). But to have, say, Aquaman turn up in an issue of Wonder Woman? That sort of thing didn’t happen very often. There are a couple of probable reasons for why that was. One was simply that at that time DC wasn’t as concerned about building an interconnected fictional universe as they’d become in later years (influenced, of course, by Marvel Comics, who in 1966 had already made that approach one of the most distinctive features of their line). But another was that DC’s superhero comics were produced under the auspices of several different editors, each of whom had his own particular way of doing things, and essentially ran his own shop. So, although Julius Schwartz edited Justice League of America, he oversaw the individual comics of only five of the titular super-team’s members — Batman (whose books he’d taken over only the previous year), plus the Flash, Green Lantern, the Atom, and Hawkman (all of whom were new versions of Golden Age characters whose revivals he’d spearheaded in the ’50s and early ’60s). The other members “belonged” to other editors — Superman to Mort Weisinger, Wonder Woman to Robert Kanigher, Aquaman to George Kashdan, and the Martian Manhunter (appearing in House of Mystery) to Jack Schiff. (The remaining Justice Leaguer, Green Arrow, was something of an orphan at this time, having lost his backup feature in World’s Finest in 1964 when that book was moved from Schiff’s stable to join Weisinger’s “Superman family” group of titles.) Everyone’s characters could and did team up in The Brave and the Bold (edited by Kashdan), but that was mostly it for seeing any of DC’s A-listers besides Superman and Batman together outside of Schwartz’s JLA. The notable exceptions came in the individual heroes’ titles that were edited by Julius Schwartz himself. Early on, he established a special relationship between his two leading “revived” heroes, Flash and Green Lantern, having them learn each others’ secret identities in Green Lantern #13 (June, 1962) and become good friends. From that point forward, Hal Jordan and Barry Allen would make occasional guest appearances in each other’s books, though never so frequently that these team-ups ceased to seem like events. 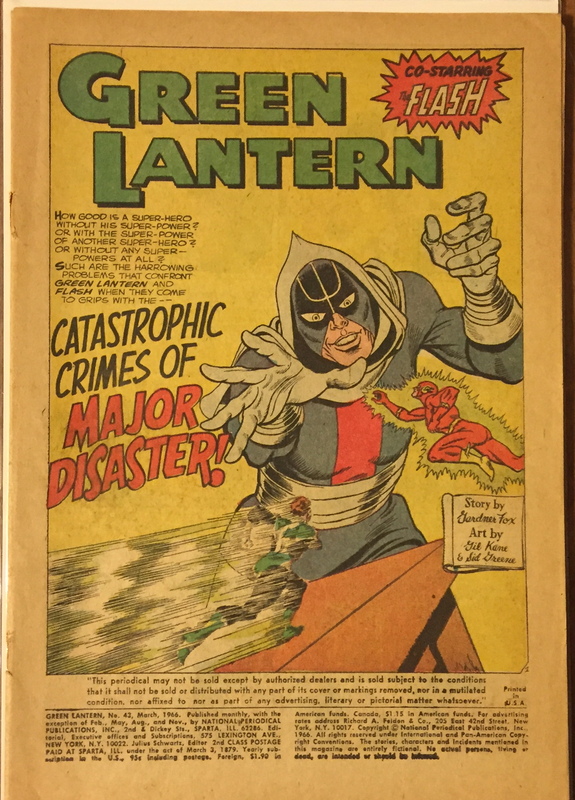 Of course, as an eight-year-old comics reader in January, 1966, I had no real conception of what a comic-book editor did, let alone any sense of how each DC series fit into one or another editor’s “stable”. Nor was I aware that Flash and GL had previously teamed up a total of five times (three times in Green Lantern, twice in Flash). When I picked Green Lantern #43 out of the spinner rack, I’m pretty sure I was just thrilled to be getting two of my favorite heroes in one adventure for the price of a single comic. Responding to the earthquake, the heroes soon discover that a group of costumed men are using the disaster as an opportunity to rob a bank — also, that both thieves and bank are being left untouched by the earthquake’s effects. Before they can apprehend the bandits, however (though not until after they’ve stopped the earthquake and rescued the endangered citizens, fortunately), both heroes find themselves suddenly drained of their super powers. 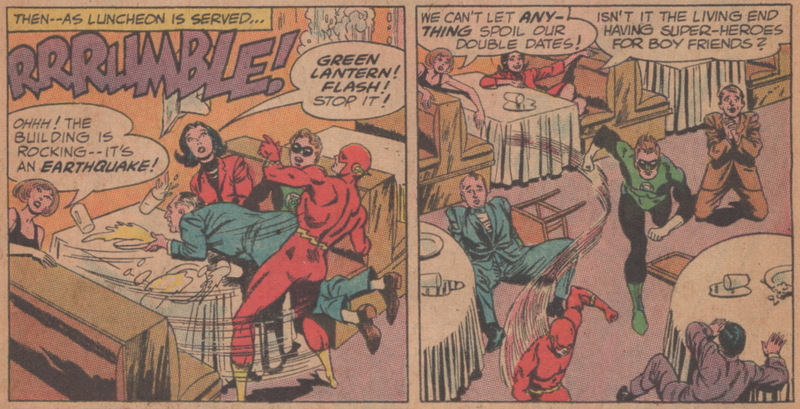 Flash reasons that since the same force that swapped their powers also creates disasters, their use of the swapped powers may be making the disasters worse. (Um, OK.) They resolve this problem handily by having Flash simply use his ring energy to switch their powers back, and then they’re off after Major D. again. Before they can capture him, however, the Major accidentally electrocutes himself while attempting to use his secret weapon, “the greatest disaster-maker of them all!” Oops. 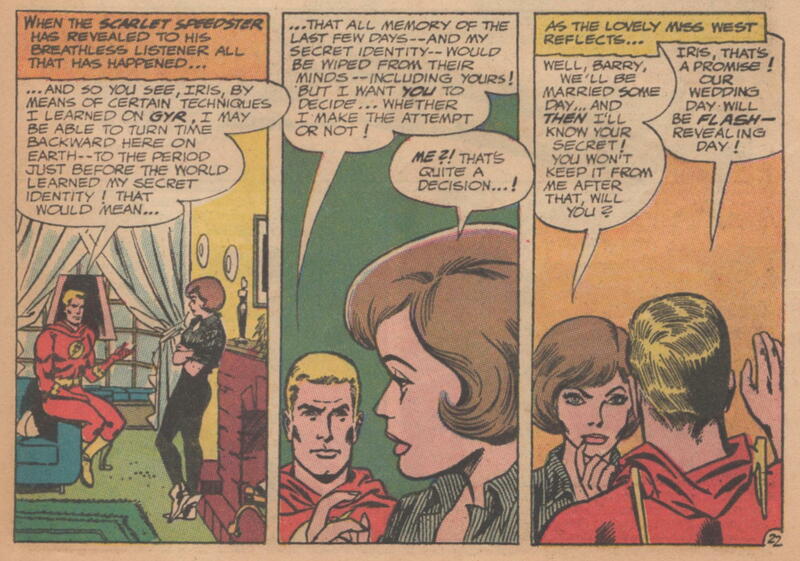 Well, at least GL won’t have to bother with mind-wiping his knowledge of their secrets away. The Flash and Green Lantern would go on to team up two more times before the close of the decade. However, they weren’t the only heroes in editor Schwartz’s stable who semi-regularly guest starred in each other’s books. While he was conservative about having Batman appear in other characters’ titles, and vice versa (probably because the Caped Crusader was already regularly teaming up with other heroes in World’s Finest and The Brave and the Bold), Schwartz did establish a “buddy” relationship similar to that between Flash and GL between his two other revamped Golden Age superheroes, the Atom and Hawkman. 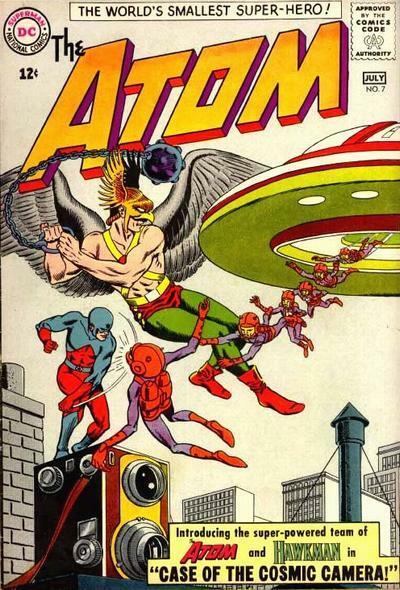 The characters first met in Atom #7 (June-July, 1963) and would go on to share a number of adventures thereafter, alternating appearances in one another’s books until their two comics, both suffering declining sales, were eventually combined into a single title, The Atom and Hawkman, in 1968. Of course, as I’ve already said, I didn’t understand that Flash, GL, Atom, and Hawkman were all under the direction of a single editor, which was why they got paired up regularly while others — say, Aquaman and the Martian Manhunter — didn’t. I just thought it was really cool that within the larger framework of the Justice League of America, there were these three other distinct, if smaller, teams — Superman and Batman, the Flash and Green Lantern, and the Atom and Hawkman. And as these pairings have continued to be featured by comics writers and artists virtually all the way down to the present day, I guess I’m not the only one who felt that way. No idea what happened to the cover. It’s just gone, and the staples have pretty much had it as well. I think I basically just read this one to pieces.